If you like to burn candles in your home, but have pets you should follow a few precautions in order to prevent injuries or fires. Some candles have also been deemed as hazardous to our health along with companion animals of all kinds. Were you aware that your typical paraffin-based wax candles emit harmful toxic chemicals? If they are harmful for you, you can be sure that they are harmful to your pet. Natural soy-based candles do not contain the same toxic chemicals and are generally safer to burn in your home. If you do burn candles in your home with your pets around, following a few simple safety precautions can help to prevent accidents from occuring. Keep lit candles out of your pet's reach. A happy wagging tail can easily knock over a burning candle. Also, never leave your pet unattended in the same room as a burning candle. I recently had the opportunity to review a candle from DiamondCandles which I'd like to talk about today. If you haven't heard of DiamondCandles, let me fill you in first. DiamondCandles are 100% soy, eco-friendly, and natural. I love this because it makes me feel better about burning their candles in my home around my pets and kids. 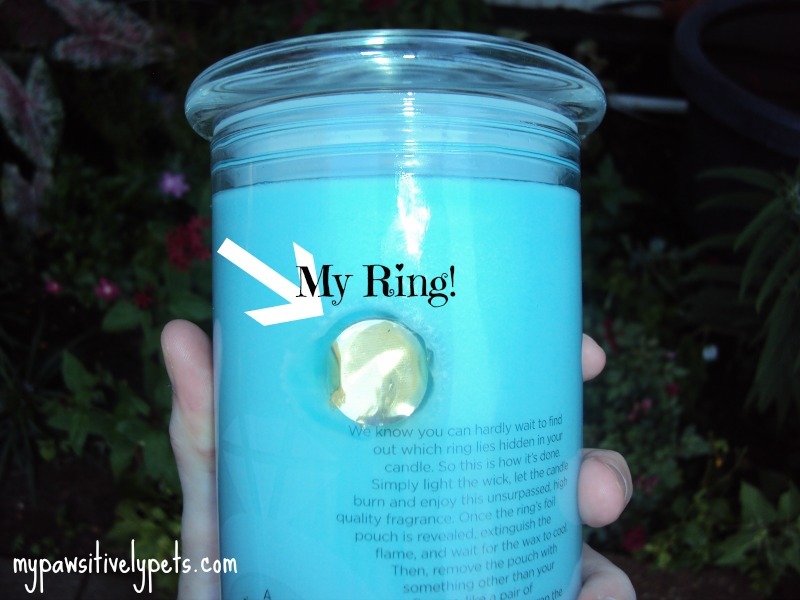 The fun part is that once you burn your candle down far enough, there is a surprise waiting inside - a ring! Typically, I don't find burning candles all that exciting, but this is just so much fun. The rings inside the candles can be worth anywhere from $10 to $5000! I ordered the "Cuddle" fragrance candle. I chose this scent because the description sounded like it would smell like my little baby after her bath - a scent that I adore. It's supposed to smell clean, fresh, and similar to baby powder. 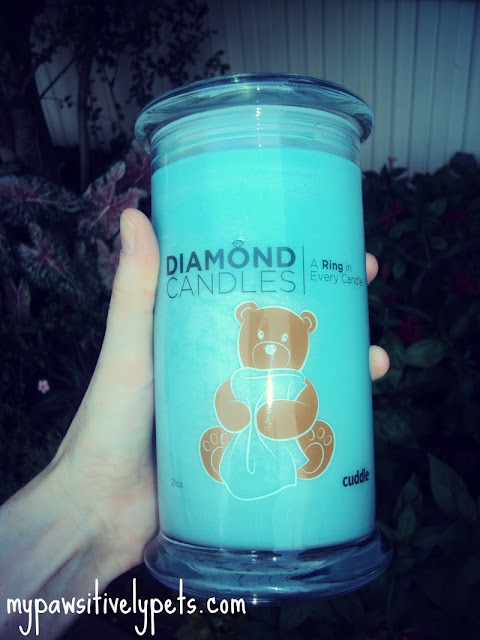 When my DiamondCandle arrived, the smell was definitely noticeable before I even lit the candle. I was also surprised by the size - they are big! Of course, I lit the candle as soon as I got the chance and watched the wax burn down hoping I could get my ring out soon. The scent of the candle is much more subtle than I had expected and is not overwhelming at all. In fact, there are times I wish it were just a little bit stronger. I burned my candle for several hours that night and just couldn't help myself any longer. I had to dig out that ring! I felt like a kid waiting for Christmas or something. I poked and prodded a little and got my ring out. The rings are sealed inside a plastic baggy inside of a foil package. The ring while it's still inside the candle. I thought my ring was very pretty, being my favorite color of purple and all. I am disappointed about the size of the ring, however. It's really big and my fingers are pretty tiny. It's even way too huge for my thumb and fit my boyfriend's manly sized ring finger. I don't know much about ring sizes, but I'd guess this might be an 8 or something? I also don't think the ring is worth much money. I researched the markings inside of it, and it seems as though it's not real gold or silver and comes from a manufacturer in Thailand. I also consulted with my father who used to own a pawn shop and knows a little bit about jewelry. But as far as costume jewelry goes, it's very nice. Its heavy and doesn't seem like cheap costume jewelry if that makes sense. Overall, I really enjoyed my DiamondCandle even if the ring is too big. I can tell it's going to last me for a very long time. The candles are priced at $24.95 which is more than I might want to pay for most candles. However, I think that for all you get with a DiamondCandle the price is more than fair. I do wish that DiamondCandles implemented some way of telling their customers exactly what type of ring they have in their candle once they get it out. If you want to see some of the rings people get out of their candles, visit the DiamondCandles Facebook page or Pinterest board. I caught myself getting sucked in to looking at all the pretty rings people found in their candles. 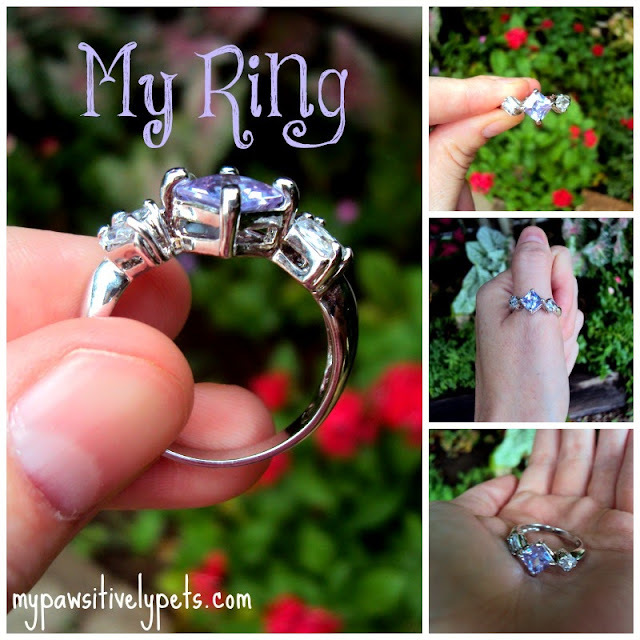 I'm happy to announce that DiamondCandles is offering one Pawsitively Pets reader a chance to win their own DiamondCandle! This giveaway is open to residents of the US only. The giveaway starts now and ends on August 29th. Please fill out the Rafflecopter form below to enter. 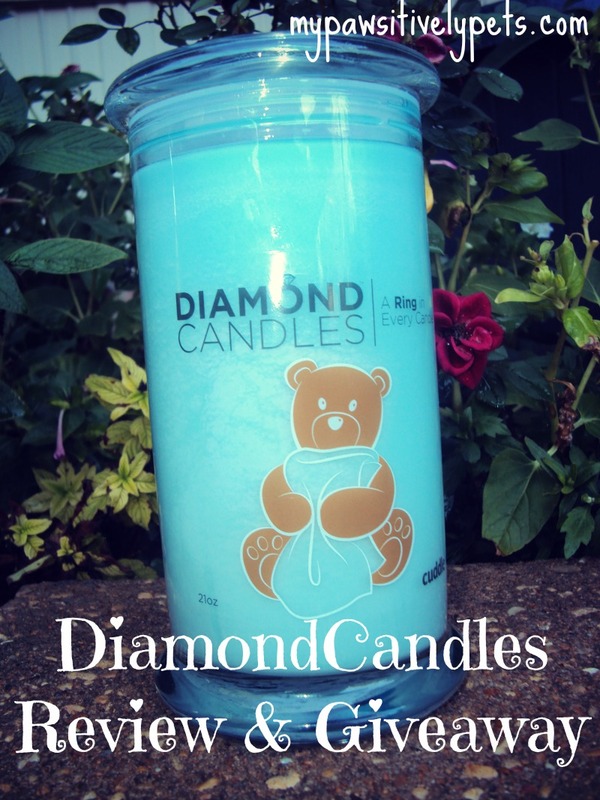 You will be added to DiamondCandles mailing list when you enter. If you don't know how to use Rafflecopter, watch this video. If you still have questions, please feel free to contact me! Good luck! Disclosure: I received a free product from DiamondCandles in exchange for an honest review. All thoughts expressed here are my own. Pawsitively Pets is not responsible for shipment of prize to giveaway winner. Winner will have 48 hours to respond via email otherwise a new winner will have to be selected. You can imagine that if you burn candles, they must not be too low on the ground in case pets can reach them. Thanks for sharing this! That is an interest product. I myself am not a huge candle fan in general, but it is neat to know about these ones. Well that is kind of cool and that is very clever with the rings! Have a tremendous Thursday Ann as usual don't include us. Great tips Ann! These candles look awesome! How's the aroma? Thanks for the chance to win! The aroma is pretty good and not too strong. I wish it were a little stronger sometimes. Good luck! I don't have facebook, but I do have pinterest so hopefully I did it properly because I have wanted to get one of these for a while, they are sooo cool! Hey Kirby, I'd check for you but I didn't make this widget so I can't. You should be good to enter without Facebook though so good luck! I love soy candles. I don't think that is a bad price if it is a decent sized candle. $10 is expensive for costume jewelry but that ring is pretty. If it was actually worth something, you could get it resized. TW used to love burning candles when she first moved to the condo but hasn't burned any in years. They're just gathering dust. She always burned them up high so Nicky, Autumn or I couldn't get them. We knew some had iron in their wicks but we didn't know the wax was toxic. and, BTW, TW didn't go to BarkWorld. As the blog says, her friend took George and forgot me. That is a really cool idea, though like you, I think it would be better if you knew what the ring was worth when you get it. It was very pretty though, but too bad it was too big for you. I wonder if they are all that big? I am always careful about keeping burning candles up high where the animals can't get at them. But I did not know paraffin candles could be toxic, so thanks for sharing that! Some candles are too strong for me, so I kind of like the idea of a bit more mellow scent. Those would definitely make a fun gift. According to their website, the rings in the candles are different sizes all some of the more common ring sizes. These ones are definitely not too strong. At least not the scent that I got anyways. I also read some other people saying that the scent was pretty light too. I think the ring sounds like fun no matter what the size!